نقدی, رضا, نادعلی, الهام, یونسی کردخیلی, حامد. (1394). بررسی خواص خمیرکاغذ تولید شده با روش حلال آلی الکل کاتالیز شده با نمک های کلسیم و منیزیم از جوان چوب افراپلت. مجله صنایع چوب و کاغذ ایران, 6(1), 31-40. رضا نقدی; الهام نادعلی; حامد یونسی کردخیلی. "بررسی خواص خمیرکاغذ تولید شده با روش حلال آلی الکل کاتالیز شده با نمک های کلسیم و منیزیم از جوان چوب افراپلت". مجله صنایع چوب و کاغذ ایران, 6, 1, 1394, 31-40. نقدی, رضا, نادعلی, الهام, یونسی کردخیلی, حامد. (1394). 'بررسی خواص خمیرکاغذ تولید شده با روش حلال آلی الکل کاتالیز شده با نمک های کلسیم و منیزیم از جوان چوب افراپلت', مجله صنایع چوب و کاغذ ایران, 6(1), pp. 31-40. نقدی, رضا, نادعلی, الهام, یونسی کردخیلی, حامد. بررسی خواص خمیرکاغذ تولید شده با روش حلال آلی الکل کاتالیز شده با نمک های کلسیم و منیزیم از جوان چوب افراپلت. مجله صنایع چوب و کاغذ ایران, 1394; 6(1): 31-40. در این تحقیق، ساخت خمیر کاغذ از جوان چوب افرا پلت با استفاده از الکل و کاتالیزور با هدف بررسی خواص خمیر‌کاغذ و کاغذ حاصل بررسی شد. ویژگی‌های بیومتری (طول الیاف، قطر و ضخامت دیواره الیاف) و میزان ترکیبات شیمیایی جوان‌چوب افرا‌پلت (سلولز، لیگنین، مواد استخراجی و خاکستر) تعیین شد. متغیرهای پخت شامل دمای پخت (190 و 200 درجه سانتیگراد) و زمان پخت (40، 60، 80 دقیقه) بود که با مصرف 280 میلی‌لیتر متانول، 70 میلی‌لیتر آب، 025/0 مول کلرید‌کلسیم و 025/0 مول نیترات‌منیزیم در یک محفظه پخت تحت‌ فشار و نسبت مایع‌پخت به چوب 7 به 1 انجام گرفت. بازده غربال خمیر‌کاغذ‌های حاصل ( 9/54% تا 91/60%) و عدد کاپا (5/15 تا 4/18) تعیین شد. پس از پالایش خمیرکاغذها تا درجه روانی 350 میلی‌لیتر در پالایشگر PFI، از هر نوع خمیر‌کاغذ تعداد 10 برگ کاغذ دست‌ساز 60 گرم بر متر مربع تهیه شد. خواص مقاومتی کاغذهای دست‌ساز مانند طول پاره شدن (83/3 تا 25/4 کیلومتر)، شاخص مقاومت در برابر پاره شدن (22/10 تا 81/12 mN.m2/g ) و شاخص مقاومت در برابر ترکیدن (71/1 تا 11/2 kPa.m2/g) اندازه‌گیری و با خواص مقاومتی خمیرکاغذ کرافت حاصل از جوان‌چوب افرا‌پلت مقایسه شد. Shatalov, A.A. and Pereira, H., 2004. Arundo donax L. reed: new perspectives for pulping and bleaching. Part 3. Ethanol reinforced alkaline pulping. Tappi Journal, 3(2): 27–31. Yawalata, D. and Paszner, L., 2004. Anionic effect in high concentration alcohol ganosolv pulping. Holzforschung, 58(1): 1–6. Mcdonough, T.J., 1993. Chemistry of organosolv. Tappi Journal, 76(8): 186–193. Dapía, S., Santos, V. and Parajó, J.C., 2002. Study of formic acid as an agent for biomass fractionation. Biomass Bioenergy, 22(2): 213–221. Pan, X., Arato, C., Gilkes, N., Gregg, D., Mabee, W., Pye, K., Xiao, Z., Zhang, X. and Saddler, J., 2005. Biorefining of softwoods using ethanol organosolv pulping: preliminary evaluation of process streams for manufacture of fuelgrade ethanol and co-products. Biotechnology and Bioengineering, 90(4): 473–481. Aziz, S. and Sarkanen, K.., 1989. Organosolv pulping: A review. Tappi Journal, 72(3):169- 175. Lönnberg, B., Laxen, T. and Sjöholm, R., 1987. Chemical pulping of softwood chips by alcohols. Paperi ja Puu., 69(8): 757-762. Stockburger, P., 1993. An overview of nearcommercial and commercial solvent based pulping process. Tappi Journal, 76(6): 71-74. Dahlmann, G. and and Schroeter, M.C., 1990. The organocell process: Pulping with environment in mind. Tappi Journal, 73(4): 237-240. Black, N.P., 1991. ASAM alkaline sulfite pulping process shows potential for large-scale application. Tappi Journal, 74(4): 87-93. Kirci, H., Bostanci, S. and Yalinkilic, M.K.., 1994. A new modified pulping process alternative to sulfate method alkalinesulfite- antraquinone-ethanol (ASAE). Wood Science and Technology, 28(2): 89-99. Paszner, L. and Cho, H.J., 1989. Organosolv pulping; Acidic Catalysis options and their effect on fiber quality and delignification. Tappi Journal, 2(2): 135-142. Akgul, M. and Kirci, H., 2009. An environmentally friendly organosolv (ethanol-water) pulping of poplar wood. Environmental biology academy of Environmental biology India, 30(5): 735-740. Lora, J.H. and Aziz, S., 1985. Organosolv pulping: a versatile approach to wood refining. Tappi Journal, 68(8): 94-101. Ziaie-Shirkolaee, Y., Mohammadi-Roshandeh, J., Rezayati-Charani, P. and Khajeheian, M.B., 2008. Influence of dimethyl formamide pulping of wheat straw on cellulose degradation and comparison with kraft processs. Bioresource Technology, 99(9): 3568-3578. Dadswell, R., 1985. Variation of juvenile and mature woods. Wood and Fiber Science, 16(1): 111-117. Newman, A. and Deborah, C., 1972. Biometric differences of softwoods. Lzforschung, 28(2): 18-24. Paszner, L., 1998. Catalysed alcohol organosolv pulping. In: Environmental Friendly Technologies for the Pulp and Paper Industry. Young, R.A. and Akhtar, H., John Wiley & Sons Inc., NY, p. 69-100. Tappi Standard Test Methods, Tappi Press, Atlanta, Ga, USA., 2009. Chen-Lung, H., Keng-Tung,W., Eugene, W. and Yu-Chang, S., 2012. Kinetic study of carbohydrate dissolution during tetrahydrofurfuryl alcohol/HCL pulping of rice straw. BioResources, 7(4), 5719-5736. Atik, C., 2002. Soda-AQ pulping of okra stalks. Cellulose Chemistry and Technology, 3(4): 353-356. Copur, Y., Tozluoglu A. and Karademir, A., 2007. Pulping of licorice: An alternative raw material to produce pulp. Cellulose Chemistry and Technology, 41(2-3): 155-159. Yongjian, X., Kecheng, L. and Meiyun, Z., 2007. Lignin precipitation on the pulp ibers in the ethanol-based organosolv pulping. Colloids and Surfaces: Physicochemical and Engineering Aspects, 301(1-3):255-263. Naghdi, R., Hosseini, S.Z. and Resalati, H., 2008. Evaluation of paper properties obtained from maple juvenile wood through Kraft pulping process. 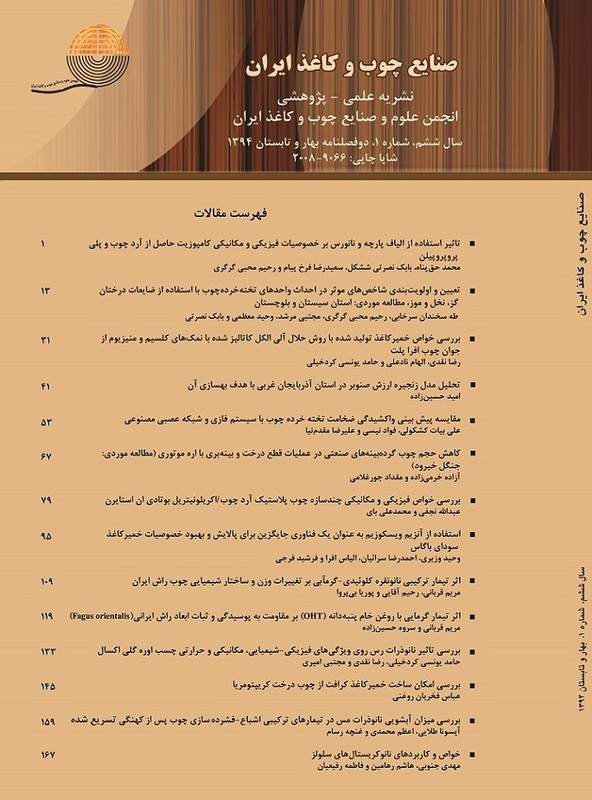 Iranian Journal of Natural Resources, 60(4): 1465-1472. Gilarrahz, M.A., Oliet, M., Rodriguez, F. and Tijero, J., 1998. Ethanol-water pulping: Cooking variables optimization. The Canadian Journal of Chemical Engineering, 76(2): 253-260. Pazner, L. and Behera, N.C., 1995. Beating behavior and sheet strength development of coniferous organosolv fibers. Holzforschung, 39(1): 51-61. Sahin, H.T. and Young, R.A., 2008. Autocatalyzed acetic acid pulping of jute. Industrial Crops and Products, 28(1): 24-28. Saberikhah, E., Mohammadi-Roshandeh, J. and Rezayati-Charani, P., 2011. Organosolv pulping of wheat straw by glycerol. Cellulose Chemistry and Technology., 45(1-2): 67-75. Indian Standard, Kraft paper specification, ISP 2805., 1991. Japanese International Standard, Kraft papers, JIS p 3401.,1992.